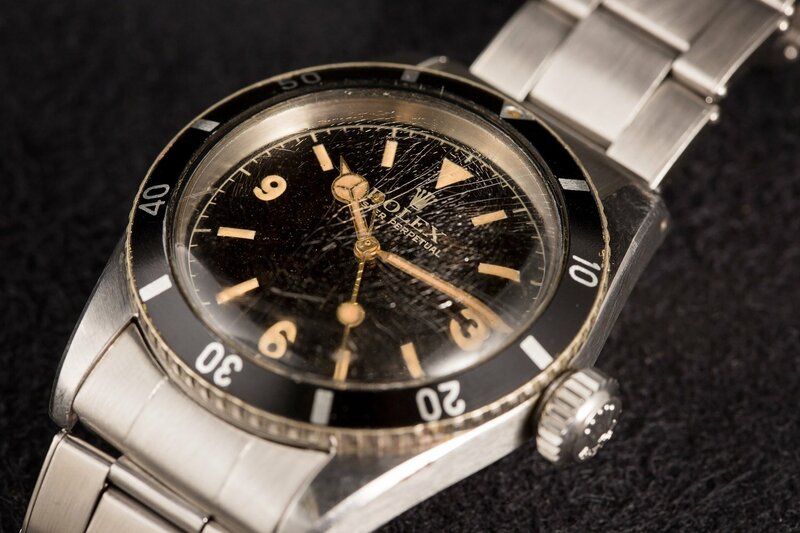 The Rolex Submariner 6200 is a legend in vintage Rolex collecting circles. One of the earliest Submariner models, Rolex manufactured this particular reference for only a short period. Its limited production run coupled with some very distinct design details makes the Submariner 6200 one of the most sought after vintage Rolex models out there. 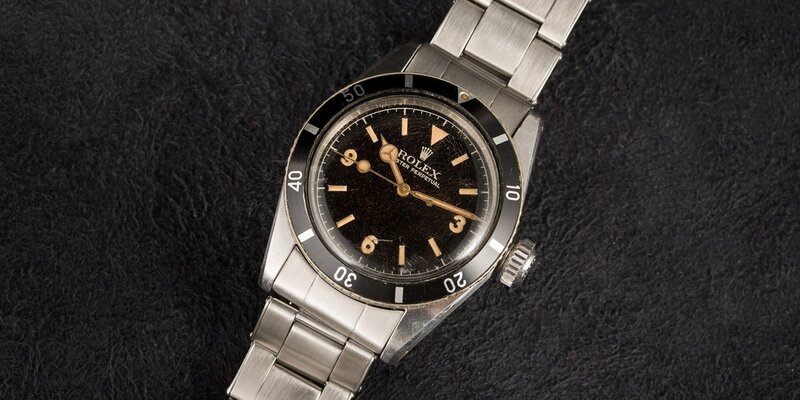 Brush up on your Rolex history with six quick facts about the Submariner ref. 6200. 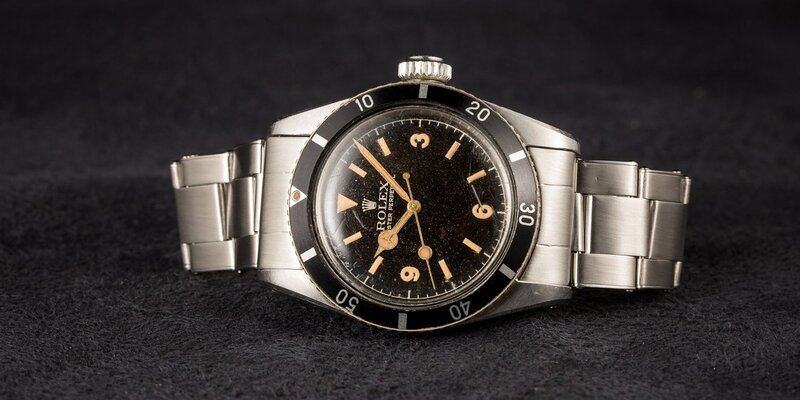 The Rolex Submariner 6200 is a vintage watch that is very difficult to find. 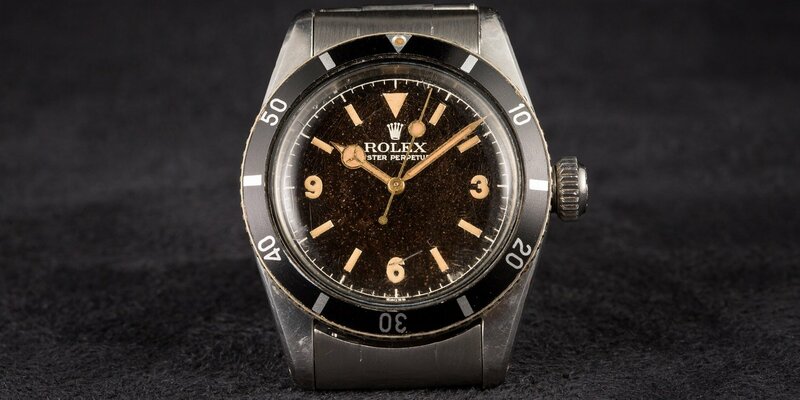 While there is still some debate, it’s widely accepted that the very first Submariner was the reference 6204, which Rolex released to the public in 1953. One year later, Rolex added the Submariner ref. 6200 to the famous family of diving watches. It’s estimated that Rolex made approximately 300 examples of the Submariner ref. 6200 with serial numbers ranging from 319xx to 32xxx. This watch has a nickname for its oddly large crown. One of the most distinguishing features of the Sub 6200 is its large 8mm Brevet winding crown. Since the 8mm crown is noticeably larger than the 6mm winding crown of the ref. 6204, the 6200 is widely known as a “Big Crown Submariner”. Other Big Crown Submariner watches include the ref. 6538 and the ref. 5510. 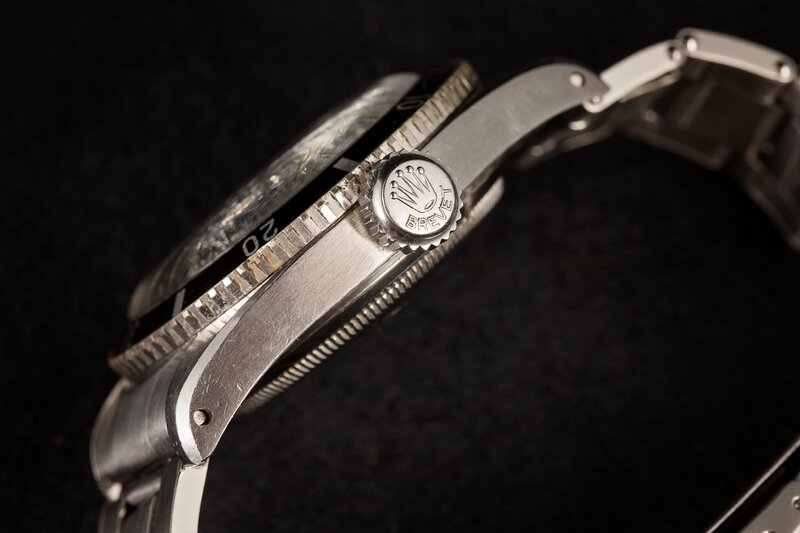 The winding crown includes the Rolex coronet (crown) with the “BREVET” text under it. Brevet is French for patent. Here is a close up shot of the Rolex Submariner 6200. Another distinct feature of the Submariner 6200 is its gilt Explorer style dial with the 3/6/9 numerals along the simple baton hour markers and inverted triangle at 12 o’clock. Although rare, the Submariner 6200 is of course not the only Sub to have an Explorer style dial—it is also found on the 6538, 5510, 5512, and 5513. This 6200 does not even have the word “Submariner” on it. Interestingly, although it is estimated that there are only around 300 examples of the ref. 6200, there are still some dial variations. Some examples have the big logo and “Oyster Perpetual” text under 12 o’clock while some have a smaller logo and text. Some do not have the “SUBMARINER” label above 6 o’clock while others do. Also, in 2013, Christie’s sold a Submariner ref. 6200 with “Officially Certified Chronometer” text under the “Submariner” label for CHF 485,000. The auction house maintains that this is the only known example of the Submariner 6200 to include the “OCC” text. One of the first mercedes hands from Rolex. The 6200 was the first Submariner to include the now ubiquitous Mercedes-style hands. Prior to that, the ref. 6204 had pencil style hands. However, it’s important to note that the Mercedes-style hands of the Submariner 6200 are actually longer than those on other subsequent references. What are your thoughts on the Rolex Submariner 6200? Comment below. Though the Submariner 6200 does not include the depth rating on the dial, it was indeed water resistant to 200 meters. This is double that of the 100-meter depth rating of its sibling references, the “Small Crown” Sub 6204 and Sub 6205 watches. Also different is the A296 automatic movement encased within the Rolex Submariner 6200 compared to the A260 automatic movement found inside the ref. 6204 and ref. 6205 Submariners. The differences in the movement are due to the case sizes—the “Small Crown” Submariners had slimmer cases than the “Big Crown” Submariner 6200. Often referred to as the “Holy Grail” of vintage Submariners, the Submariner 6200 is certainly on the wish list of many collectors. 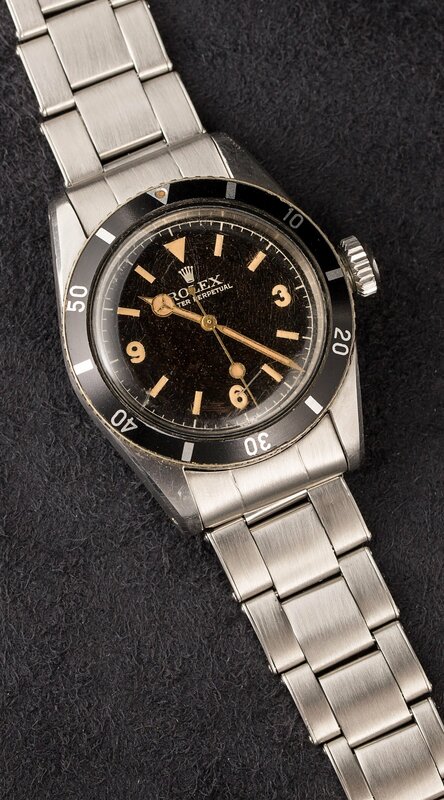 A very early example of Rolex’s now-famous diving watch, the Sub 6200 combines many desirable traits all in one must-have timepiece.